Average: GBP, NZD. The preferred range is from 4 to 5. 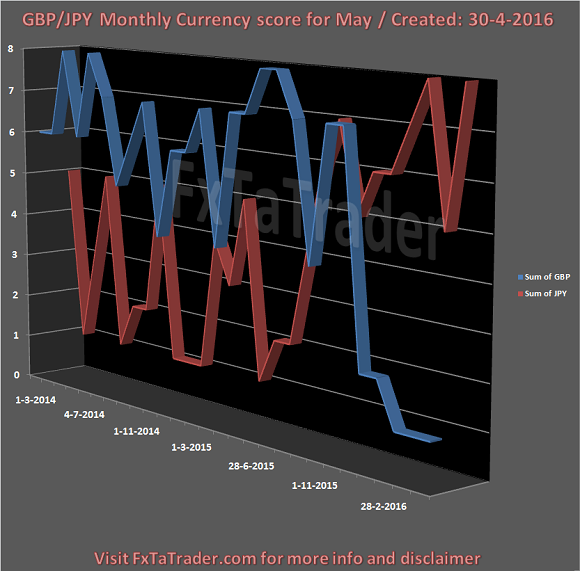 The charts were provided in the article: "Forex Currency Score Month Classification May 2016"
The 12 Months Currency Strength and the 12 Months Average are provided here below. This data and the "12 months Currency Classification" are considered for deciding on the preferred range. Because it is not ideal nor desired to change the range for a currency every single week, we perform several checks to avoid this. 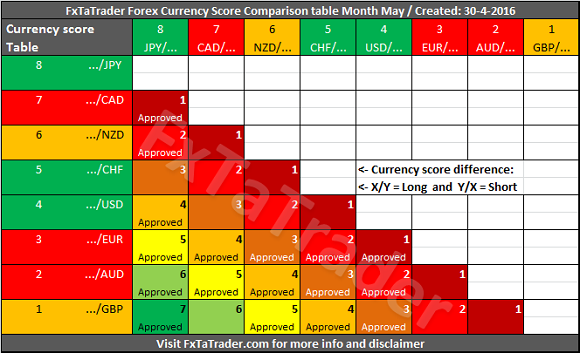 Besides these the "12 months Currency Classification" chart of each currency is also consulted and compared. A switch took place in the Currency classification between the GBP and the JPY. The latter one has a higher "Avg. 12 M." score compared to the GBP. The JPY also had 6 times a higher score in the last 12 months. This happened in the last 5 months and in October 2015. When looking at the Classification chart itself it is clear to see that the JPY is stronger lately, the chart is provided here below. When looking at the Monthly and Weekly charts of this specific pair they are both showing a downtrend. The Monthy chart is nearing the Ichimoku Cloud and the pair is near the support level which was a resistance in the period Q2 and Q3 of 2013. The Tenkan-Sen is crossing the Kijun-Sen downwards. The MACD entered in negative area and the histogram is showing a lot of momentum. The Weekly chart is clearly in a downtrend and all signs are pointing down. The Ichimoku and MACD Indicators are clearly in a downtrend. By using the comparison table directly below you can get a view without the volatility and statistics as opposed to the "Ranking and Rating List". Only the strength of each currency against the counterparts is analyzed by using the Technical analysis charts of the 3 Time Frames that are also used for the monthly "Ranking and Rating List". Based on the last "12 months Currency Classification" and the "Currency Comparison Table" the most interesting currencies for going long seem to be the JPY, CHF and the NZD. These are strong or average currencies from a longer term perspective when looking at the last "12 months Currency Classification". For going short the same analysis can be done and the EUR, AUD and the GBP seem to fit best. These are weak or average currencies from a longer term perspective. When analyzing the Monthly and Weekly charts the best pairs to trade for the coming week seem to be the GBP/JPY, AUD/JPY, USD/JPY, CHF,JPY. The CHF/JPY is not in the "Currency Comparison Table". The CHF/JPY is also not mentioned in the interesting pairs for the Ranking and Rating list. However, if we compare these pairs only with the "Currency Comparison Table" they are almost all approved except for the GBP/CAD. 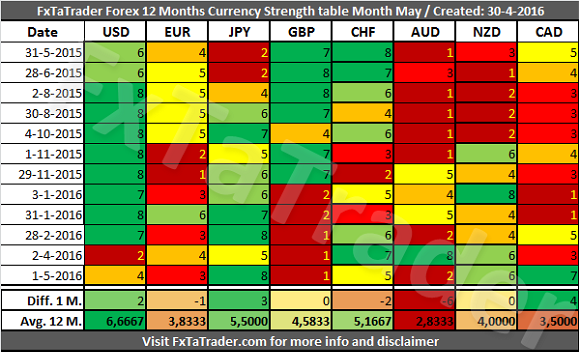 The Forex "12 Months Currency Strength" and the "Comparison Table" provide meaningful data for my FxTaTrader strategy. Besides this I also use the "Forex Ranking, Rating and Score" which is also available once a month on my blog at FxTaTrader.com. If you would like to use this article then mention the source by providing the URL FxTaTrader.com or the direct link to this article. Good luck in the coming month.